Like: Devil May Cry, 24, Street fighter, Eleco games like.. Fireworks, Sindbad, ect... All with big LCD screens. Let me know your location and price. Now thats a far drive, 12H 36M.... Don't know if i'd drive that far for a machine i've never played Wanna ship it if I decide to get it? well maybe you wanna buy my Indiana Jones pachinko also? make it a FRYday night and it'll be a PARTY!! So i'm looking for games in the (GAMERA or Beast Sapp type cabinets, Big LCD screens), I don't want any plain 3-reel machines. Anyone in or around NJ selling or trading? I have 2 vintage pachinko's 1 type A and one type B, a vintage Zangus II, and a Monkey Magic 97. The 2 pachinko's and 2 older slots are sold, But i'm still looking for some big screen LCD games, In the "gamera type" or "Beast Sapp" type machines. I got a Don Don King tonight! I'm very happy with it And i'm picking up a "Fireworks" on Tuesday afternoon.. CAN'T WAIT! If you can find one I would suggest Popeye. It is a fun machine with some really vibrant colors. DDK is a good machine as well. I liked the action the top reels gave. Ima dummy, I have the names mixed up. Silly me. sorry, can someone tell me the real name of this machine? Chris wrote: If you can find one I would suggest Popeye. It is a fun machine with some really vibrant colors. If someone is selling this near NJ let me know, I'd love to buy it. Oh, and 'thanks' for the 'thanks'. I'm in mid tear-down on the other new machine, it's down to the wood, and all the parts are all over the living room waiting to be wiped-down and reinstalled. I need 2 parts for this machine if anyone has them up for sale. 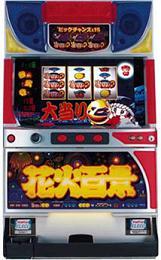 2- "Win/Bonus menu that sticks on the front upper panel to the left of the coin slot. On the UP-SIDE it already has volume controls installed! I will get a set ready for you if you decide have them done. I though you were getting the "Fireworks" machine not Hanabi Hyakkei. That is a good machine. I like the fact that you can shoot the 3 sevens on the left reel during a Big Bonus to get up to a 711 payout. It puts the 'skill' in 'skillstop'.